Reliable Environmental Solutions has a staff of qualified professionals who serve as an invaluable resource in the ever-changing environmental world. They are providing practical application of the various government regulations and guide our students from start to finish though the often times overwhelming world of environmental compliance. Our memorandum of understanding serves to provide practical knowledge to the students by taking them to different areas like water management and waste management projects. Pro CAD TECHNOLOGIES is a pioneer in education with focus on quality and technical concepts. The Unique Selling Point is their expertise and excellence in transfer of Software knowledge to Academic students in the form of Finishing School. We have a tie up with this institute and so civil software trainings are automatic\will be no problem. We believe that software training is an endless chain of learning for any professional. Our students acquired excellent academic records and industrial exposure. 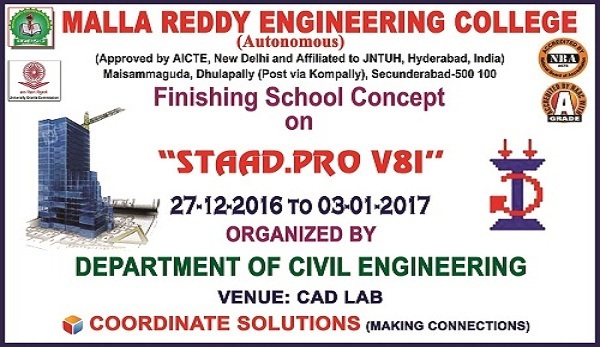 AUTOCAD 2015, STADD PRO V8i, RIVET, TECLA, BIM….